“Twenty-five researchers from seven research institutes have put their heads together to draw up rules for designing high-efficiency organic solar cells. 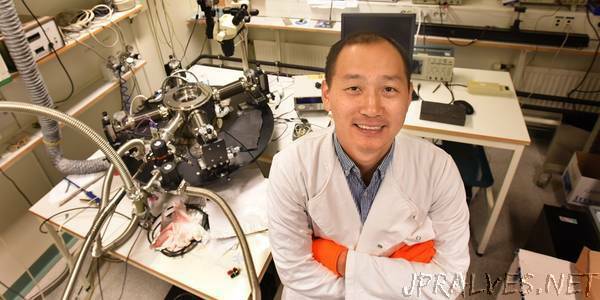 The research is led by Feng Gao, associate professor at LiU. An article have been published in Nature Materials. Organic solar cells, made from carbon-based materials, present unique advantages compared with other solar cell technologies. For example, they can be manufactured through low-cost printing technologies, and they can be made semi-transparent with selectable colours, which can be used architecturally in building integration. Their flexibility and low weight make them perfect for powering the sensors for the internet of things applications. A key challenge facing the development of organic solar cells is that they usually have large energy losses. “We have formulated some rational design rules to minimise energy losses in organic solar cells. Following these rules, we present a range of examples with low energy losses and high power conversion efficencies”, says Feng Gao, associate professor at the Division of Biomolecular and Organic Electronics at Linköping University. The design rules, which challenge some previously held ideas, have been published in an article in the prestigious journal Nature Materials. Using these design rules, organic solar cells promise to catch up with their competitors with respect to power conversion efficiency, which measures the fraction of the energy in the sun’s radiation that is converted to electricity. The theoretical limit for the fraction of the sun’s energy that can be obtained in solar cells is around 33%. Laboratory experiments with silicon-based solar cells have achieved 25% at best. Researchers have until now believed that the limit for organic solar cells is lower. “But we now know that there is no difference – the theoretical limit is the same for solar cells manufactured from silicon, perovskites or polymers”, says Olle Inganäs, professor of biomolecular and organic electronics, Linköping university. When photons from the sun are absorbed by the semiconducting polymer in a solar cell, electrons in the donor material are raised to an excited state, and holes are formed in the ground state to which the electrons remain attracted. In order to separate these bound electrons and holes, an acceptor material is added. However, this acceptor material usually results in extra energy losses, an issue that has bothered the organic solar cell community for over two decades. What the researchers have now shown is that if the potential difference between donor and acceptor materials is minimised, the electrons only need to make a small transition, and the energy loss can be decreased. The hole that the electrons leave behind even so starts the transport of charge. However, the minimised potential difference between the donor and acceptor materials does not guarantee low energy losses. Another factor is the heat emitted by certain charge carriers instead of light, which is what is required in an efficient solar cell. The researchers have also found a solution to the second problem. In order to produce a solar cell that can use as large a fraction of the sun’s spectrum as possible, mixtures of two organic semiconductors are used. One of them has a large bandgap, and the other has a small bandgap. The materials have different high levels of photoluminescence, where the high value means that the electrons most often emit light. In a material with low photoluminescence, heat is produced instead. “The second rule we have formulated is that the materials with low bandgap have high photoluminescence”, says Feng Gao. - Minimise the potential difference between donor and acceptor components. - Make sure that the low-gap component in the blend has a high photoluminescence. The researchers at the seven research institutes in the US, China and Europe have together produced around a dozen different materials, some of which have been reported previously and others are completely new. They have used these to demonstrate that the new theory agrees with experimental results, even though it is somewhat incompatible with what was previously believed.